Though we have never met, I am a friend of Guy's and certainly appreciate the updates and images. I am glad you and your team are safely off the mountain. Guy will be missed by all of us. On behalf of the Winnipeg Police Service Forensic Identification Unit, I would like to thank you and all of Guy's fellow climbers for everything that has been done for Guy. It is clear that his untimely death has affected everyone of his team-mates past and present, as it has we who had the good fortune to know and work with him. We will miss him beyond what my feeble words can express. The following is a transcript of our tribute placed on the WPS internal PoliceNet for all members to see. There are also links to photos as well as copies of the comments made on this and the Peak freaks site. "On October 4, 2008 members of the Identification Unit learned the heartbreaking news that Cst. Guy Leveille #1647 died accidentally in the Himalaya Mountains of Nepal and Tibet. Guy was on an expedition to summit Cho Oyu, 20 km west of Mount Everest. In Tibetan Cho Oyu means “Turquoise Goddess.” It is the sixth highest peak in the world. 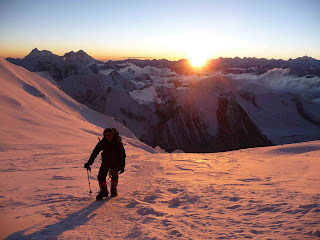 Guy’s passion for mountaineering started about 5 years ago when he visited Everest base camp. He quickly became a competent climber and has challenged himself on some of the most difficult peaks in the world; Ama Dablam, Aconcagua, Rainier, Athabasca and others in the Canadian Rockies. His passion for climbing was tempered by a resolve to help the less fortunate and he climbed for the Children’s Wish Fund. Guy was a dedicated police officer. He joined the Winnipeg Police Service on January 23rd, 1989, and served in Patrol, Youth and Traffic Divisions, and most recently, in the Identification Unit. He was an expert in his field. His service has been exemplary and in the Identification Unit he raised the bar for excellence. He was respected not just for his professional abilities but for his strength of character, sense of humour, humility, and selfless attitude. It made him a person you enjoyed being around and one who you wanted to have in your life. We were proud of Guy’s accomplishments. He has touched the lives of many. His friends in the Identification Unit are heartbroken that he will not be returning. We wish in vain to hear his laughter, his tales of Kathmandu, of Tibet, and of the mountain. A huge void remains in the lives of his family and friends. Guy will be sadly missed, but fondly remembered. He was kind, warm-hearted and sincere. A man we are proud to call friend. There was no gentler, stronger, or manlier man than Guy Leveille. At the request of his family, Guy rests in the embrace of Cho Oyu - “Turquoise Goddess” in the shade of mighty Everest. The mountain is his tomb; and the Himalayas are his monument." I am also very saddened by the loss of Guy Leveille, fellow officer and friend. I am in the Forensic Field with the RCMPolice, and had the pleasure of getting to know Guy over the past years. We will all miss his winning smile and genuine zest for life. His personality had immediate impact of those around him. I know Guy had an incredible passion for mountain climbing, and so looked forward to the challenges. He was a remarkable person, that through his presence, taught us what really matters in life. My sympathies are extended to all his family and friends. So sorry to hear of the tragic events, my condolances to Guy's family, and the rest of you. Enormous effort by all, very inspiring and emotional for all the rest of us. I walked with Guy on his first exposure to the wonder of the high country on our trek to Everest Base Camp in October 2003. He was fascinated with the concept of the high mountains since childhood and was determined to fulfill his desire to be at Everest Base Camp as a 40th birthday present to himself. He was enchanted by Kathmandu, fascinated by the scenery and he admired and respected the people we met, both the Nepalese and the trekkers and climbers from around the globe. Everyday as we walked from Jiri to the foot of Everest and back to Lukla he became stronger and was filled with an energy that came from being in those high mountains. I feel his passion for climbing was kindled the morning that he got to the top of Gokyo Ri (5483m). He was the first person on the summit that day and had the top of the mountain to himself for over and hour. It is ironic that from the top of Gokyo Ri he first saw Cho Oyu at the head of the Gokyo valley. It was a clear day and he often spoke about the beauty and the wonder of that experience. To be at the top of a mountain, regardless of how high you have climbed, is a very spiritual experience and I think that this feeling is what motivated him to embrace climbing as fully as he did. Guy grew up on the prairies and had rarely seen the mountains but he found his passion in climbing. In the next five years he trained intensively and developed his skill level to a point where more experienced climbers were confident in his ability to take on climbs like Ama Dablam, Aconcagua and Cho Oyu. Guy was a considerate, conservative and cautious man. He assessed the risks he took very thoroughly and was very aware of the danger he exposed himself to when climbing but accidents happen and this time he paid the ultimate price for the choices he made. It may sound cliché but he died doing what he loved to do and now he rests in the heart of the high country that he grew to love.